I am constantly talking about mycorrhizae; fungi that live symbiotically within plant roots that locate and transfer soil nutrients in exchange for plant sugars. It is however important to note, that these are not the only fungal endophytes that make a living within plant tissues. To this day, the ecology of other fungal endophytes is not well known. A recent paper published in 2013 by Susan Hodgson and her team shed light on how some of these endophytes are transmitted to subsequent generations. Using several species of understory forbs, they tested their hypotheses. Fungal endophytes have been shown to be transferred vertically in other plant species, but up until this paper, has not been widely described. The vertical transmission of fungal endophytes from mother plant to its offspring indicates an intricate ecological interaction that has been conserved over the vast expanses evolutionary time. The most understood, non-mycorrhizal fungal endophyte lives inside many species of grass, and is called Epichloë coenophiala. 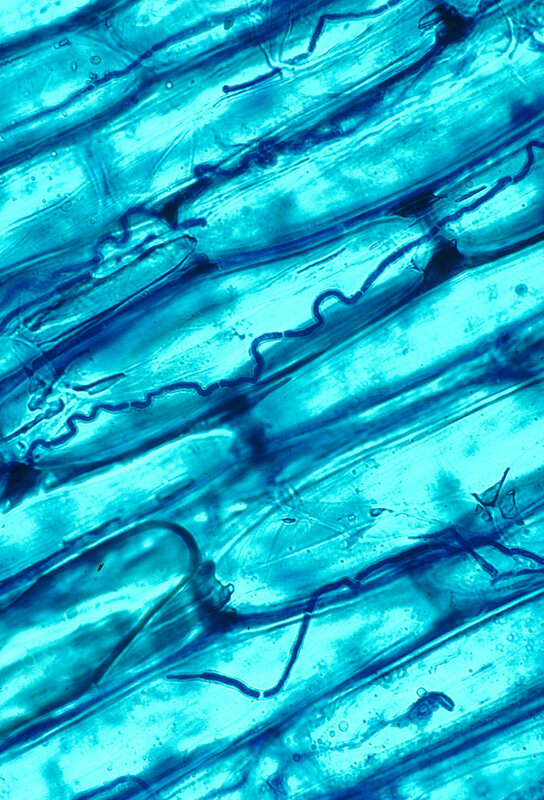 Inside the plant, the fungal endophyte acquires plant nutrients similar to mycorrhizal species, but instead of allocating nitrogen and phosphorus to the plant, the fungus produces a multitude of toxins. You might be confused by this, as this relationship swerved into a more parasitic realm, but I can assure you, the grasses associated with E. coenophiala actually benefit from the toxins produced. The toxic alkaloids the fungal endophyte produces actually deters mammalian herbivory. In fact, the reason we know most about this specific species interaction is because livestock that are fed grass infected with the fungal endophyte usually become ill with "fescue toxicosis." This disease is an economic hardship as the mammalian livestock then have poor weight gain, elevated body temperature, and reduced conception rates. Plants become more fit with this fungal counterpart, and over time, through natural selection a process for vertical transmission has evolved. These researchers understood this aforementioned ecological interaction, and questioned why vertical transmission of fungal endophytes hasn’t been described more frequently. So, they set off to better understand fungal endophytes living inside three perennial, and three annual understory forbs. Their main hypothesis was that endophytes grow on the plant seeds just like the E. coenophiala-grass interaction. Their alternate hypothesis was that the fungi grows on plant pollen, and can be transmitted both vertically and horizontally via visiting insect pollinator. To test these hypotheses, they collected 180 seeds, and 300 stamens from each of the six-plant species. They then placed the plant structures on nutrient gel agar plates to cultivate the microorganisms living on them. The fungi that grew on the agar were later isolated and identified. Fungi was isolated from various plant tissues, but surprisingly, fungal endophytes occurred on pollen and on plant seeds. All and all, their analysis found 26 different fungal endophytes, with each plant having their own unique assemblage of fungi. Fungal species isolated from different plant parts. Hodgson et. al 2013. These identified fungi only represent a small subset of fungal endophytes living in plant tissue, since in most cases, culturable organisms signify just 10% or less of the entire population. If this study used next generation sequencing, there’s a great change that more than 26 fungal species would be identified. Even with just 26, and with the notion that each plant species had their own unique community, we now understand that these species interactions are quite striking. This is not just a weak parasitic interaction in which fungal spores from the soil randomly infect plant tissues. These fungi are transmitted vertically to a plants offspring and, because these relationships have been conserved, they most likely serve an ecological purpose. Of these 26 fungi identified a handful were more dominant than the others. The fungus Alternaria alternate was found in all six-plant species, and in known to produce compounds that too reduce herbivory and can actually limit opportunistic parasitic fungi. Also, the fungal endophyte Cladosporium sphaerospermum was also found in all six-plant species, and it too enhances plant fitness by producing gibberellins, a compound that promotes plant growth. Gibberellin, a compound Cladosporium sphaerospermum produces that enhances plant growth. This study showed that vertical transmission of fungal endophytes is a widespread mechanism that has broad ecological implications. Some of the most dominant fungal species in this study produce substances that ultimately enhance plant fitness. Biological compounds that reduce herbivory are extremely expensive to synthesize from a plants perspective. Over millions of years, plants have evolved an intricate relationship with compound producing endophytic fungi. These fungi extend their hyphae to plant reproductive structures, where they are passed both vertically to the next generation of plants and horizontally to non-related plants via visiting pollinators. Evolutionary processes left alone for long enough really have made the forest floor a place to ponder over. What else don’t we know about?